Like it or not, Germany totally outclassed Brazil last night, and the goals came thick and fast. The commentators summarised it bluntly, and concisely after goal 3: “Brazil are being humbled, humiliated, and ripped apart”. 5 goals in 30 minutes. I went to bed even before the first half had finished. From the sounds of it, some of the Brazilian fans felt the same way. There really wasn’t any need to watch the rest of the match. Well, it looks like I missed 2 more goals by Germany and one consolation goal by Brazil. 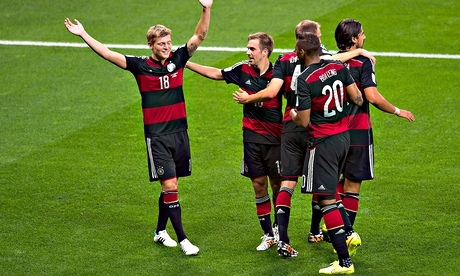 World Cup records tumble as Germany destroy Brazil 7-1 | Football | theguardian.com.